"We've gotten the city to suspend the open-container law for this 5 pm to 9 pm event," said Downtown Development Authority head Don Shea of the outdoors downtown Happy Hour being planned for Thurs, Ap 16. Shea was once head of the New Orleans downtown organization, and knows what happy hour is like in the Crescent City and in Lafayette. 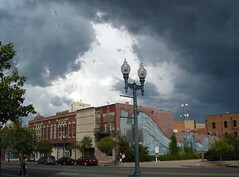 "In Lafayette, they began with a similar event called First Friday. It proved so popular that it became an Every Friday event." Why is Shreveport trying it on Thursday? To take advantage of the Thursday Night Trolley service. The TNT, a successful event produced by Bonne Summers for SRAC and DDA, will provide no charge transportation. Sites involved in launching the walk-or-ride libation loop are 1) Artspace 2) Robinson Film Center 3) Noble Savage 4) Sully's 5) Stray Cat (site of the Josh Brolin affair) and 6) the Blind Tiger. There will be 2 bands playing, says Shea. Past that, details are being addressed as the planning continues. Shea told the Times " "The happy hour thing is a way to create community. It's not a typical festival or a concert. It's kind of an off-center thing to do." It's not clear yet how visual artists will be a part of the Happy Hour. If you've got an idea that you've seen work in another locale, email a proposal to SRAC or call one of the watering holes. The freshly-painted House of Usher site got a new mud painting logo this week and features the story of a giant figure called Zelma the Red Love Draw Voo Doo Doll. Usher has used Flickr.com carousel photo displays to add oscillancy to the site. Thus there's a continually rotating display of her portraits and art. That's one of several ideas all blogger / artists should adopt. The logo at Usher's news blog, Red River Blog Jam, is even more moscocious. And, in her words, "Because a full-time job and one blog isn't enough," she has numerous other sites. They're all part of what you ought to follow if you give a fig about the ideas, people and art of 'SB Land." 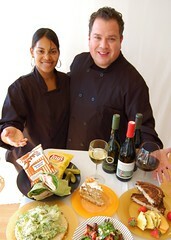 The cafe'@artspace offers supper before and after the opera on Sat, March 28, says Tracye Ford. Wine and dine from 6 to 10 pm. An example: creamy vidalia onion soup with crostini and cheese. Limited a la carte menu, soups, salad & entree - before and after the Mozart. Great wine selection, delicious desserts, reminds Michael Chisum. 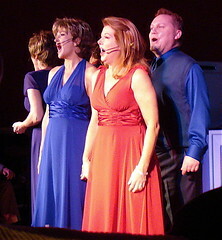 Cosi Fan Tutte at Riverview Theater, 7:30 pm, adds Sumer Cooner. 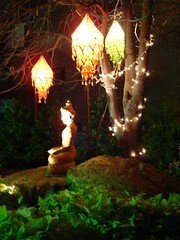 See shreveopera.org. Consider a shot of a child with lightly tinted cheeks and an armful of vivid flowers, a black and white beach festooned with red and blue striped umbrellas: you've wondered whether you could pursue the art of hand coloring on your own. With the proper tools and instruction, says Freda Powell, you can create professional-looking hand-tinted photographs. An adult-oriented Hand-Coloring workshop will be held on Sat, April 4, from 10 am to 1 pm at the Barnwell Center. Instructor is Jennifer Worley. Work in oil-based pencils - provided. Bring your own photographic prints - to be approved by the instructor 2 days in advance. $50 for members and $65 for non-members. Fee includes supplies. Six spaces available. Our theme for this year is “West meets East,” says Mary Grace de Joya Vea of the ASEANA Foundation's 2nd annual festival. Visitors to the festival will be treated to Asian culture and cuisine set amidst a sea of blooms of the different Asian Gardens. These gardens include the “Ikeda Obaitouri” Japanese Garden, the “Two Dragons chasing the Pearl” Chinese Garden, the “Jardin De Isabelle” Philippine Garden, the “Angkor Garden” Cambodian Garden, the “Sophy’s Hands” Fountain Garden, the “Spirit House” Thai Garden, the “ Mahabodhi Park’ Indian Garden, and the “Lumen’s Delight” Burmese Garden. Participants include the Herbal Society, Orchids Society, Origami Japanese Paper Folding, Asian inspired clothes, goods and baskets, jewelries imported from Asia, Face Painting, Aromatherapy, American Flint Napping, Bonsai Exhibits, Ice Carving and fruit carving demonstrations and many more. Also: dance and music. 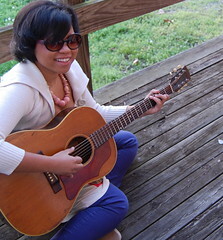 Says Marsha Brown, of the singing duo Cahoots: "Hello, fellow artists. Monty and I are in Minneapolis touring with our films and will miss the Artist Roster meeting, but hope you'll let us know of any major decisions or developments. 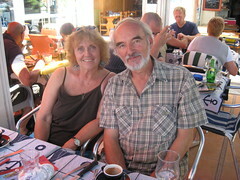 We're showing a lot of our newest travelogue, "Etched in Stone / Scotland to Provence", and it goes over well with our audiences. The most fun, though, is when we show "Hello, Louisiana". They love all the music and they get to see that Louisiana includes much more than New Orleans. Anyway, think of us as we freeze up here in the great North!" Centenary Student Awareness Week will focus on Gaza in an attempt to educate the campus community about the ongoing humanitarian crisis, says Nadine Kakskas. A panel discussion on Thurs, March 26 at 6:30 pm in the Student Union Building will include Dr. Chris Ciocchetti, who will speak about the ethics of the situation, Dr. Gloria Walker, who will be discussing human rights, and Dr. David Stafford on the psychology of warfare. All students and community members are encouraged to attend. The event is open to the public. 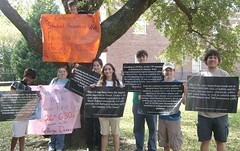 Among the students posting awareness bulletins this week are (l to r) Delisha Powell, Elisabeth Roselli, Molly Broderick, Catherine Walsh, Nadine Kaskas, Mark Moehle, Brandon Sepulvado, and Riley Adams. 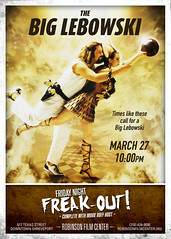 Chris Jay sez, "the Robinson Film Center's Friday Night Freak-Out presents THE BIG LEBOWSKI on Friday, March 27 at 10:00 PM. The film will be screened from a rare 35mm film print." Abby Singer's Bistro, the full-service restaurant and bar located inside the RFC, will be offering a special on White Russians to celebrate the screening. And, Jay adds with a considerable smile, "Nice marmot!" KSCL, 91.3 fm, presents Anavan, also featuring A.J. Haynes, in concert on Tues, March 24, 8 pm In Kilpatrick Auditorium, says Casey McBeath, who adds,"There is a $5 cover but it should be a great show." 1) Dial up myspace.com/anavan and get the music going. 2) Find flickr.com and search "Anavan." Hit slideshow. 3) Observe. Twitch. Oscillate. Enjoy. Montessori School for Shreveport has its first benefit auction online, says Angie Day. Shreveporters will have the most interest in the bidding, since many of the items to be auctioned are from restaurants - Cush's to Carrabba's - and other service-oriented businesses - golf, photography, dance, etc - in East Shreveport. 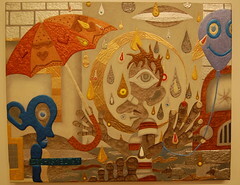 But there are some items, such as art, that might be valuable to a person in Portland. Example: artist Talbot Hopkins is offering a discount of $1000 on a head & shoulders portrait done in sanguine crayon or pencil (client pays photography fee). The full cost of the portrait would be $3000. Items will be added as the week of auctioning unfolds, says Day. Says Tyler Davis of Centenary College radio station KSCL FM, "Come and see some awesome bands perform- AJ Haynes, Three Day Weekend, Electric Dollhouse Groove Buggy, Riverside Railway, Missoni Lanza, Louisiana Haywire, Eye of Anger, and Sumthin Serious! It's hosted by KSCL radio. It starts at 2 P.M. at the Centenary Shell and best of all... It's Free !!!!! There is also a $1 raffle. So come and have a great time!" *We'll have a white sheet and paints, and for a donation, you can paint something, make handprints, etc with the paint!" says Maysa Kaskas. "This sheet will be displayed at our Youth tentsite at the Relay for Life, so definitely come & support us and then attend the Relay & check out the finished product!" Says Joy Shan of the American Cancer Society's Race for Life Youth Fundraiser, "I'd encourage you to come out & support us, even if you can only stay a while-- bring friends & money to donate; it should be a lot of fun!" If you'd like to help out at this event: you can donate paints, white bedsheets, or just your time! November 5, 1969, marked the first issue of the limited edition of “the Dali Alice,” the complete text of Lewis Carroll’s Alice’s Adventures in Wonderland with 13 mixed-media originals by Surrealist artist Salvador Dali. Only 2,500 copies were printed, each hand-signed in pencil by the artist. The Norton is fortunate to have one of these limited editions. The book became so in demand in bookstores throughout the country that it had to be “rationed,” with the publisher limiting the number of copies sent to each city. The portfolio contains 12 illustrations and an original color etching opposite the title page. 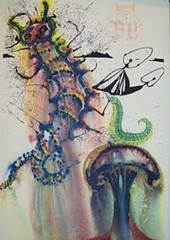 Dali created a fantasy for each of Carroll’s chapters and illustrated the text with mixed media graphics. The text and illustrations are printed on 11 1/2” x 17” specially made Mandeure rag paper. The pages are not sewn together, and there is no binding. Instead, text pages and art pages are enclosed in an enormous silk-lined case-portfolio, featuring linen and leather over heavy board, and fitted with ivory pins to hold it closed. The original copper plates and woodblocks were cancelled after the last impression was made, making it impossible to ever print from them again. Alas, Kohl, says, the items described in the newsletter's From the Vault articles are not on display. Wonder what else the Norton owns that might constitute a proper display on such a phantasmagoric artistic thread? Cosi fan Tutte, the timeless story by Mozart, tells the story, says Sumer Cooner, of two men who set out to prove their fiancées’ faithfulness. Singing across from Susan Yankee will be successful young Cajun singer Lori Guilbeau, a native of Bayou Lafourche country who has won awards in Europe and the US. Learn more about the opera and the cast at www.shreveportopera.org. Cosi fan tutte will be performed in English. My favorite territory and strong recommendation is the Zach Skelton exhibit. This former New Orleanian - a Katrina transplant - has a wacky and charming way with portraits and landscapes. He sold 13 pieces of work at his opening, says Bonne Summers. He's the most appealing emerging artist I've seen here in quite a while. 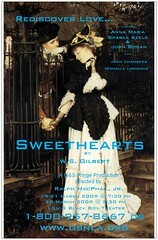 Sweethearts is a tender comedy / romance from the pen of W. S. Gilbert, says John Goddard. It will unfold at LSUS from March 19 to 22. 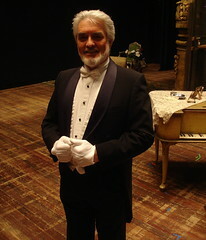 The director for the show, Ralph MacPhail of Austin, Tx, has had a lifelong fascination with Gilbert & Sullivan and has become an expert in things Gilbertian. The cast of the coming performances includes local community theatre stalwarts John Bogan and Anna Maria Sparke Keele supported by John Chambers & Michelle Loridans. March 19 - 21 @ 7:30 p.m.
March 22 @ 2:30 p.m.
Btw, I heartily recommend the Black Box Theater as a venue. I've attended 3 plays there and the intimacy suits me entirely. Acoustics? Sight lines? Unimpeachable. What is the Shreveport Symphony? The Board seems to believe the SSO is whatever musicians they can get to play for what they want to pay. We believe the SSO is a specific group of highly talented musicians who have worked together for many years, who have a rapport with the symphony audience, are long-standing members of the community and are involved in every aspect of the musical life of the Ark-La-Tex and the musical education of its children. The musicians of the SSO wish to reaffirm our desire to see this conflict resolved so we can return to the stage and perform. Unfortunately the Board has refused to move from its initial offer since it was first presented and rejected by us over 17 months ago. Libby Siskron stated, "The board won't see a 60-year organization die without a fight." The question is whether fighting the musicians of the symphony is the way to save the organization. The statement represents the thoughts of musicians Peter Haas, Thomas Hundemer, Mike Scarlato, Rick Rowell and Theresa Zale. McNeil St Pumping Station vibrations: NYC electronica musicians Zeena Parkins & Ikue Mori in concert on Sat, April 25, says minicine? 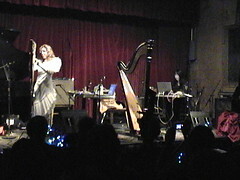 Of the album Phantom Orchard, Amazon reviewer Penril wrote, "I got word of Zeena Parkins by listening, as many people, to Björk and watching her live shows. I remember Zeena playing the harp, the electric harp, celeste and the accordeon in the same gig, which I thought was wonderful. Then I started digging for her own music, and I came to Phantom Orchard. I wasn't surprised to see that the album was a collaboration, and then I was a little perplexed to find that the collaboration was with Ikue Mori, as I had only seen a very harmonic side (muscially speaking) of Zeena Parkins with the song "Generous Palmstroke" she wrote with Björk. To be honest I didn't know what to expect, and then the beautiful tension of "Jezebel" started. I felt I was being abducted by aliens with the first electronic sounds of the track. Then the harp started, and gave the melody a very interesting twist, making it very mysterious and giving it a somewhat crystal cave feeling to it. I can't say I wasn't disturbed by the sounds that were entering my ears at first, but later on I found them brilliant. It's actually very hard to explain this album with words, it's one of those you'd have to listen for yourself. The most similar thing I can think of is Björks "Drawing Restraint 9", composed for Mathew Barneys movie, and even with the minimalistic eccentric sounds the soundtrack for DR9 has to offer, it really isn't as phantasmagoric and alien-like as Phantom Orchard." An evening with Phantom Orchard, Zeena Parkins and Ikue Mori, will be presented by minicine? on Sat, Ap 25, at McNeil Pumping Station (north of Big D's BBQ on Common St). $10 donation. 3. Lyle Tuttle – famous tattoo artist from San Francisco, CA – will be talking about the history of tattooing in the United States and his experiences as a well known tattoo artist. Please see more at LyleTuttle.com. · This event is free to the public. There will be a cash bar and opportunity to buy food in the café. · These seminars are for professional tattoo artists only. 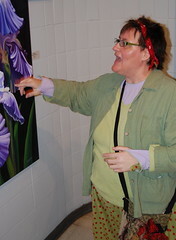 Participants must register through Leigh Elgin, artspace Exhibition Manager, before March 16th. Contact Leigh at artspace, 318-673-6535, for registration forms and more information. · Seminar fee is $150 per participant per seminar or $275 per participant for both seminars. Limited to 25 participants per seminar. - The care, maintenance and tuning of your tattoo machines should be, but second nature to you. In this way you can devote more time to tattooing and add to your income. This is a complete study of all component parts of the tattoo machine and their interaction to one another. Demonstrations and hands on work shop dealing with cutting springs; contact points; needle bars with bent eyes; needles, choice of sizes and configuration for different tattooing effects; needles soldering. Tips on how to find the raw materials that you'll need to build, replace and maintain the equipment in your studio. The basics of all good tattooing starts with your machines. Approx. 2 1/2 hours. - The DESIGNING and BUILDING of tattoo machines and equipment can make you independent and self reliant. Plus can save you some of those hard earned dollars. Tattoo machines building is cover from start to finish: Cast,fabricated or bent frames, even “frameless." Coil winding with how wire and core size effect the finished machine operation, outliner or shader? Build your own coil winder from parts you stole from your mother. Short cuts in building all the parts needed; the best raw materials and where to find them. Learn the JOYS of building. Approx. 2 1/2 hours. A week worth of shows with a ton of touring bands going to SXSW 09 in Austin, announces Mark Goff at 516 Soundstage. "All of these shows will have The Dalzell Dance Party which includes music being spun by yours truly, Mark Goff - before, between sets, and after the show." Waxing philosophical, Goff opines, "There really shouldn't be a reason that you can't go - it's different kinds of music for different kinds of people every night. Plus if this entire idea fails - I'm going to end up horribly in debt. I need money to get to California this summer!" 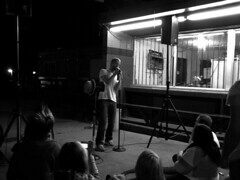 Photo of Astronautalis at Big D's by Kelly Beresko. 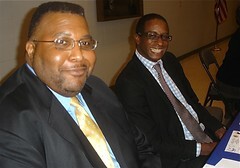 "Artist Boot Camp….For Emerging Artists, is something we discussed at a recent Artist Roster meet. Several of you have expressed your interest in assisting with this workshop. Dates to keep in mind and to discuss at our next meeting are Saturday, May 16th or May 30th. This will allow for planning and marketing of the workshop," says SRAC's Vickie Marshall. Also in her note to regional artists: "At our last meeting we discussed the need for defining a Mission and setting goals for the Roster. Please remember to forward me your ideas for Mission Statements and goals so that we can have them for discussion at our next meeting. If you were not at our last Roster Meeting, we want to see you this month, Thursday, March 26, 4:00 p.m. at Artspace. We have exciting plans for the Roster and we want all of our Roster Artists be a part of our planning." 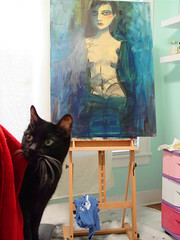 Painting in progress by Roster Artist Rachel Stuart-Haas. 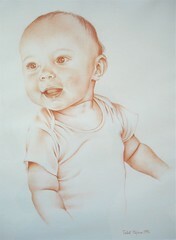 See the artist roster app at Shrevearts.org. Honk! the Musical, has been postponed due to a medical issue affecting the cast, says Ryan Williams at at the Performing Arts Center. If anyone has purchased tickets already, they will be honored for the new dates. 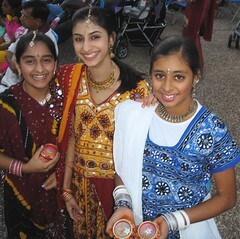 Tickets are $12 for adults and $8 for children. For more information, please call Kass Gray at 318-429-6887. 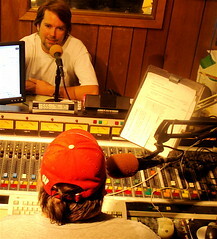 "if you like the ability to dial up jazz, classical music, news and off-beat entertainment, please donate to Red River Radio during their spring pledge drive," says Charles Carmody. 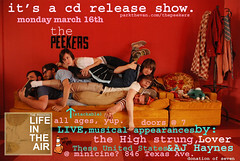 The Peekers headline an all-ages show at 846 Texas, says minicine? High Strung, Lover, These United States and local fave AJ Haynes are to entertain. Begins at 7 pm and the suggested donation is $7. Lt Gov announces Shreveport's selection as a Cultural District; how can the city leverage the designation into a more vibrant arts environment? Lieutenant Governor Mitch Landrieu will be holding a press conference Tues, March 10, at 2:00 pm in the Mayor’s Conference Room in Government Plaza, says Shreveport Regional Arts Council. He will be announcing that Shreveport has been selected as a Cultural District by the State of Louisiana. Will the mayor announce his plans to build upon this opportunity? The Robinson Film Center is proud to host, says Chris Jay, a one night-only free screening of the independent documentary Invisible Children: The Rescue of Joseph Kony's Child Soldiers, a film about the plight of child soldiers and night commuters in northern Uganda. The documentary was filmed by three young men from Southern California—Jason Russell, Bobby Bailey and Laren Poole— who traveled to Sudan "to find a story". Instead, their adventure took them into the depths of northern Uganda where they discovered thousands of people affected by the brutality and attacks of a rebel group known as the Lord’s Resistance Army (LRA), led by Joseph Kony, infamous for abducting children and forcing them to fight as child soldiers. The documentary focuses largely on the peace process in the region and efforts to save children from the LRA. Footage for the film was collected over the course of six years, says Keegan Batts, the student who proposed an airing of the film to RFC. 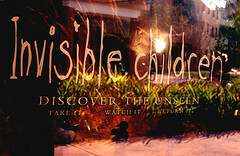 Please note that this film is not a continuation of the original film Invisible Children: The Rough Cut; it's a documentary on the war, Kony, and the failed peace process in Uganda and the rescue of the child soldiers. 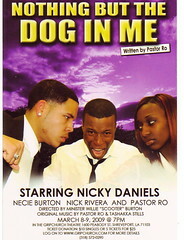 "Nothing but the dog in me" stars one of the rising stars in local theater, Nicky Daniels. The young actor has worked under directors Patric McWillams and Robert Alford. Another rising figure in the show is singer Nik Rivera. Words and music for Dog are by the well-regarded Pastor Ro. Direction is by Willie "Scooter" Burton, also a regarded media man. Theater in the round - or the rectangular, in the case of the Capri Theater - worked for the singers and musicians belting Kander & Ebb tunes in River City Rep's "And the world goes round." At the Thursday night performance it was impossible not to take the measure of the quintet. Happily, they're professionals and more than equal to the classic tunes and dances ("Cabaret," "New York, New York," etc). Dina Bennett, a former Shreveport now traveling widely as a multifaceted singer, performed with a voice both rich and admirably controlled. Seva May and Janin Pou were in their briar patch. May was, I suppose, born to cabaret. And Pou is like her sister in song. Jonathan McVay, based in Houston, was fit and earnest. Don McCoy was even more earnest and soaring of voice. The Kermit Poling-led orchestra was my favorite element. 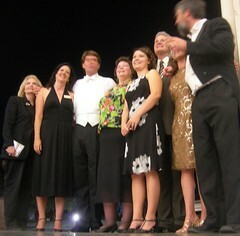 The group, composed of top-rank musicians - Shreveport Symphony players - added sizzle and punch to the evening. Jazz, blues, stage music, story-telling music: the octet took a good show and made it better. In addition to Poling, the group included Arthur Williams, flute, Thomas Phillips, clarinet, Mike Scarlato, trumpet, Mark Thompson, trombone, Christopher Allen, bass, Chandler Teague on kit and percussion and Joy Ratcliff on synth. 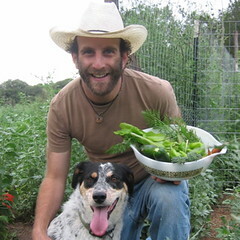 "Cool Green Integrated Lifestyle Sites"
Adventure journalist and NPR contributor Doug Fine will present a funny and engaging talk and slide-show about his efforts to live carbon neutral on his ranch in southern New Mexico, Thursday, March 12, beginning at 7 p.m. in the Whited Room of Bynum Commons. The event is free and open to the public, says Rick Delahaya. At age 36, Fine decided "to see if a regular guy who enjoyed his comforts could maintain them with a reduced oil footprint," and bought a parcel of land, dubbed it the Funky Butte Ranch and dug right into his greener lifestyle. During this presentation, Fine demonstrates with humor and perseverance the hard-won benefits of his new lifestyle in rural New Mexico. More info: Jeanne Hamming at 318.869.5082. "It's our first double billing in a long time!" So says musician Jim Huckabay. 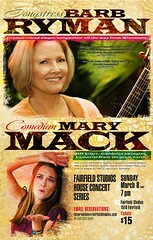 Fairfield Studios Home Concert series is featuring singer/songwriter Barb Ryman from Minnesota and comedian Mary Mack, who now spends her time crawling between Minneapolis and Los Angeles. Barb (barbryman.com) has earned praise in her home state as well as nice quotes from music authorities Dirty Linen and Sing Out! magazines. will appear on NBC's Last Comic Standing. Leader of the popular Cajun group called the Cajun-Dixon Line Band, Chris Webb is the relatively rare North Louisiana squeezebox player. To hear Webb on accordion and his wife, Elaine, on fiddle, is to journey across the history and geography of the Bayou State. A consummate musician, Webb can play all the standards, whether they be country, Cajun or Top 40. As you see in the photo, his voice and sense of rhythm can be also be augmented by guitar or banjo. He is also adept at working in guest musicians and making them sound good, too. 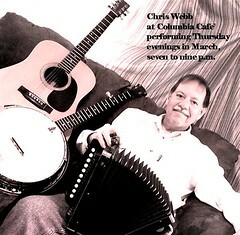 He takes over from the Recliners at Columbia Cafe on Thursday evenings in March, 7 to 9 pm. Dallas architect observes long overdue repairs at the Barnwell and asks, "What is the fate of the Barnwell Center?" Is the R. S. Barnwell Memorial Garden slated for demolition so that a new casino can occupy that location? I am an architect in Dallas who comes to your city once in a while to gamble on horses and now casinos. I was in town recently, and my wife wanted to take in some culture and suggested going to the Barnwell. Well, we got there late — 4:30 p.m. when they were closing — and only got to walk once quickly through. The art was nice. She collects pottery, but the shop was closed. The outside gardens were closing, so we walked through the conservatory. What a nice room in such run-down condition: broken windows, dead plants, uneven floors, peeling paint, trim work falling off. As I said it was closing time and we had to leave, so the only thing I asked at the front was how long had the dome been broken, and she said two years. I wanted to take a second look and maybe a photo or two, but we had to go. I tell you I have done many building inspections, and this is what it looks like when a building has been abandoned and slated for demolition. Please tell me, is this the fate of the Barnwell? Ed. 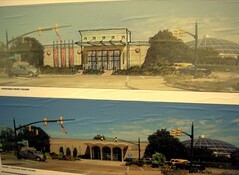 : Some 3 years have passed since the above rendering of changes slated for the Barnwell. Baroque Artists of Shreveport will perform at 3 p.m. Sunday at St. Mark's Cathedral, 908 Rutherford St. says Ruth Drummond. Bass-baritone singer Horace English will perform a solo vocal cantata by Telemann. Oboist Theresa Zale Bridges performs in a concerto by Benedetto Marcello. Baroque artists in performance Sunday include Arthur Williams, Laura Crawford, Angela Russell, Adrienne Gabriel, Ruth Drummond, Gay Grosz and Donald Smith. The concert series is underwritten by donors. Thus, no ticket charge.